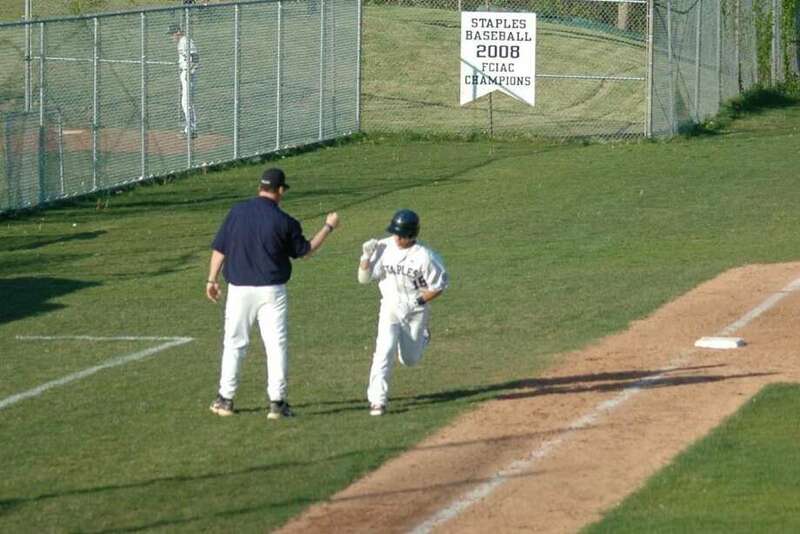 Staples junior Ben Lipper rounds third and is congratulated by Coach Jack McFarland after hitting the game-tying home run against Darien on Friday. The Wreckers defeated Darien, 6-4. The Staples baseball team is able to handle almost any opponent. Staples showed it by winning 20-3 at New Canaan last Thursday and in a come-from-behind 6-4 home win over Darien on Friday to raise its record to 11-1. "Those were big wins for us," Wreckers Coach Jack McFarland said. Staples scored seven runs in the top of the first inning against New Canaan (4-8). Senior captain lefty David Speer and senior righties Justin Honigstein and Mitch Gilbertie combined on the win. Against Darien (4-7), the Wreckers found themselves in an unfamiliar position, which was falling behind at a latter juncture of the game. Except for its loss against Westhill, Staples never trailed late in the game. Senior captain righty Jimmy Sikorski, who is healing from an injury, started for the Wreckers. McFarland's plan was for Sikorski to throw 75 pitches, which he did through four innings. "Every start, he's getting better," McFarland said. Next start for Sikorski is tomorrow at Wilton at 7 p.m. Junior lefty Rob Gau relieved Sikorski and pitched two scoreless innings and was the winning pitcher. Speer threw a 1-2-3 seventh inning to record the save. "I didn't try to strike people out and I tried to throw ground balls," Gau said. "[Senior captain catcher] Grant Moss helped me out in calling the pitches. I have confidence in my fielders as time has gone on." Junior Ben Lipper hit a first-pitch home run over the left field fence in the bottom of the fifth inning to tie it 4-4. Lipper, a lefty hitter, stroked his shot to the opposite field. "In that at-bat, I didn't try to hit a home run, I tried to get on base," Lipper said. "Fortunately, I was able to hit a home run. I was aggressive and swung at the first pitch." In the bottom of the sixth inning, junior Colin McCarthy hit a single and freshman Bryan Terzian followed with a pinch-hit single. After the Blue Wave got two outs, Lipper was hit by a pitch, which set up the stage for Moss, who hit a two-run single up the middle to win the game. "I was trying to put the ball in play and make some contact," Moss said. "I didn't feel any pressure and I just wanted to make something happen." Lipper said, "I wasn't disappointed I got hit by a pitch, I wanted to get on-base. It put two runners in scoring position for Grant and it all worked out." Senior captain Jack Hennessy also had a few hits for the Wreckers and junior Brendan Bernstein stroked a double. "Our bats have been have been hot and it's great," Hennessy said. "Coach McFarland helped us a lot with our hitting in the offseason and stresses it a lot in practice. Our ability to hit helps our pitchers." Getting this win over Darien is big because Staples showed it can win these tight games and erase deficits. "Darien has given us trouble in the last few years and it's great to get the victory because we have the tough teams in the state coming up," Moss said. "It will give us experience in games like these and this is good for us going forward because we won't win every game by 10 or more runs." Hennessy said, "This one is a good win because the upcoming games will be tough and winning games like these will help us down the stretch. It came down to Rob Gau's great performance and David Speer's ability to shut the door. We got big hits from Ben Lipper and Grant Moss, which was all we needed."